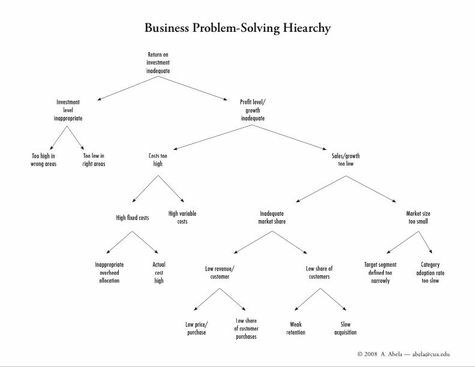 – Is this how you think about problem-solving? – Are the structure and terminology right? – What would you add, change, or delete? I perceive a fundamental problem with your military chart. The military is not threat driven; they are mission driven. 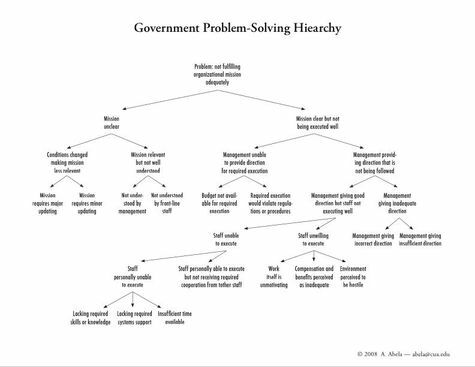 Your tree structure should flow from whether the mission is clear or not (and whether mission orders/aufstragstactic applies – in management terms whether the directiveness structure is tight or very tight), whether it can be executed or not with the resources available, …. You may want to refer to some of the materials available at the various War College web sites and the Command and General Staff web sites. In particular look at the writings of COL (USA Ret) Art Lykke. Some of this is covered in Jim Dunnigan’s books. There are also books on military decision making but you have to be careful to make sure they are written by someone talking about how decisions are really made in the military (and this differs with service – see Carl Builder’s The Masks of War) and not someone espousing how they should be made mased on some civilian algorithm. 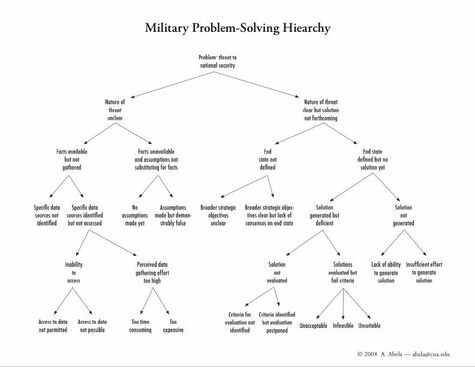 This may be a difficult undertaking but it will be necessary if you do not want to alienate the military sector, one of the primary users of presentation charts, by demonstrating a fundamental misappreciation of what and how they are. Thank you SCP, this is very helpful. I am following up on the sources you cite. YW. While I do not always agree with what you have to say, I admire your initiative and effort. If I may assist feel free to contact me via email. Veryuseful material to stimulate one’s thinking logically. Do keep me on your mailing list. Will do – glad you are finding this useful! Great! That is a pretty detailed information. I love it. Thanks much for the good post!